Larry "Wild Man" Fischer, who died at age 66 of a heart ailment a little over a week ago, on Thursday, June 16, was an eccentric figure in the late-Sixties L. A. rock scene. A formal mental patient who apparently suffered from both manic depression and paranoid schizophrenia (according to his obituary in the L. A. Times), he spent much of his life living on the streets and in the low-rent motels of Los Angeles, eventually becoming a fixture of the growing hippie scene on the Sunset Strip, UCLA and Venice, offering to sing songs for a dime. If you took him up on his offer, you were rewarded with his pathetic songs, unintentional burlesques of the top hits of the day played on his broken guitar. 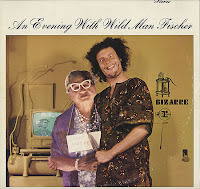 Never especially subtle in his humor, and frequently unfunny as a consequence, Frank Zappa chose to record Wild Man Fischer in the late Sixties, issuing an album on Bizarre/Reprise titled An Evening With Wild Man Fisher (1969, not 1968 as is widely reported). It was a cruel joke on Larry Fischer. I tend to agree with Dave Marsh, who characterized An Evening With Wild Man Fischer as "a particularly vicious example of Zappa's penchant for sadistic social commentary." History has shown, however, that not everyone got the jape. Marsh would write about the album, "The results are brutal, not funny except to the emotionally immature and the socially callous, and would constitute a deleted embarrassment in recorded history if the record industry had any shame" (The Rolling Stone Record Guide, 1979). In other words, what impulse leads us to portray the otherness of the insane? If you think Marsh too harsh, remember that the attribution of "genius" is simply a marketing tool, and that music is a product like any other, manufactured, packaged, and sold. The mistake is to assume that madness is somehow a more "authentic" form of existence than the quotidian reality the rest of us normally inhabit. I should point out that the insane are marked as outsiders not through their music, but through their visual representation, as the album cover pictured above reveals. 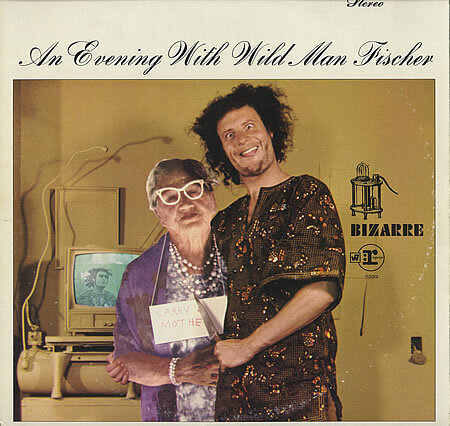 I first heard "Merry-Go-Round," the opening track on An Evening With Wild Man Fischer, early in 1970 on Zappéd, a sampler issued on Bizarre of acts on the Bizarre and Straight labels. A year or so later, during a trip to Kansas City, I picked up in a record store a copy of An Evening With . . . in the cut-out bin for 44 cents. As I remember, I could have bought four or five copies for that price at the time. I should have bought them all, for now the album is rather expensive to purchase on eBay. Now primarily a nostalgic artifact, it is of interest to Zappa collectors and students of the outré. Copies on eBay are frequently advertised as mint or mint-, I suspect because those who have owned it seldom have played it (rather like the GTOs' album Permanent Damage, also issued by Zappa in 1969). Of interest only to the socially callous and those unfamiliar with living with those cursed with mental illness, the lesson of Wild Man Fischer is that albums may be consumed, but they are not nutritious.